Sheet extrusion melt pump is a positive displacement conveyor equipment, high-precision gear clearance and volume structure design, so that a stable and balanced extrusion possible, in chemical fiber, granulation, plastic film, sheet, sheet, , Pipe, wire and cable, drawing, composite extrusion and other production lines have been widely used, and achieved good results. 1. Sheet extrusion melt pump can achieve stable extrusion, extrusion products to improve the dimensional accuracy, reduce scrap rate. In the extrusion process, the uneven feeding of materials, barrel and head temperature fluctuations, pulsating speed and other phenomena is difficult to avoid. 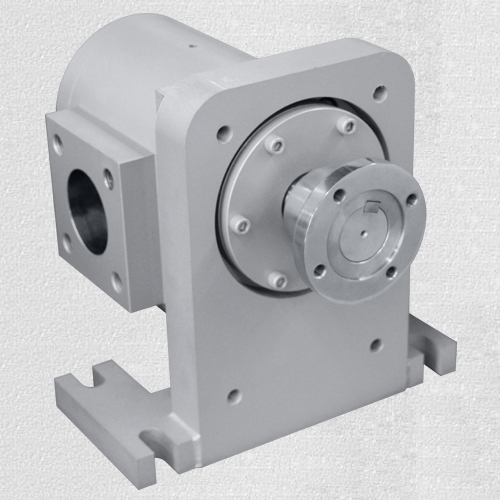 The use of melt gear pump can eliminate feeding system feeding error, can greatly reduce the upstream process of transmission fluctuations, rapid access to stable working conditions, improve the dimensional accuracy of extruded products, reduce scrap rate. 2. Sheet extrusion melt pump to increase production, reduce energy consumption, low temperature extrusion, to extend the life of the machine. Since the extruder is equipped with a polymer melt pump, the decompression function of the extruder is transferred to the gear pump, and the extruder can work under the condition of low pressure and low temperature, the leakage flow is greatly reduced, and the output is increased. Gear pumps create head pressure more effectively than extruders and reduce backpressure on the extruder, allowing the screw to withstand the axial forces and prolonging service life. In a word, melt pump for extrusion is mainly used in conjunction with extruders.The scope of melt pump extrusion application is plastic, rubber, chemical fiber.